Your office space is the home of your business. So why not design it with the same care? If your space isn’t optimized for today’s workflow it may be costing you time and money. We take the time to design spaces that meet your needs, reflect your business, and promote efficiency. At Weeks Lerman we create, plan and manage your project and suppliers from start to finish so you can get back to work. We go a step further to help you visualize your new space with a virtual walk-through of our proposed design using our advanced CAD technology. 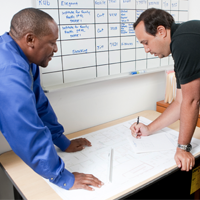 Our team designs and optimizes every square inch of your workspace. We’lll deliver an environment you’ll boast about and thrive in, all on time and on budget.